We recently styled an engagement party where we had the chance to go crazy with swoon-worthy decor, including an entryway ceiling filled with balloons and gold tassels. So what else would "Crafty Maggie" suggest than to make the tassels ourselves?! Luckily, we had a huge gold fringe backdrop laying around our office from Decorative Novelty so we figured WHY NOT. Okay so just take note, our fringe was SUPER long! So you will definitely be cutting it down and just using as much as you need until you've made enough tassels. Step 1: Roll out a couple feet of clear packing tape, facing UP, so the sticky side is out. Tape DOWN the ends so it stays in place. Step 2: Taking as much fringe as possible in your fingers, place them across the tape, next to one another, so they stick. Step 3: Clip the pieces at 18" long, continuing to tape down the fringe along the tape until you've covered all the sticky space. Step 4: Pull off a bundle of pieces (about 10-15), folding them neatly in half using your pencil or pen. 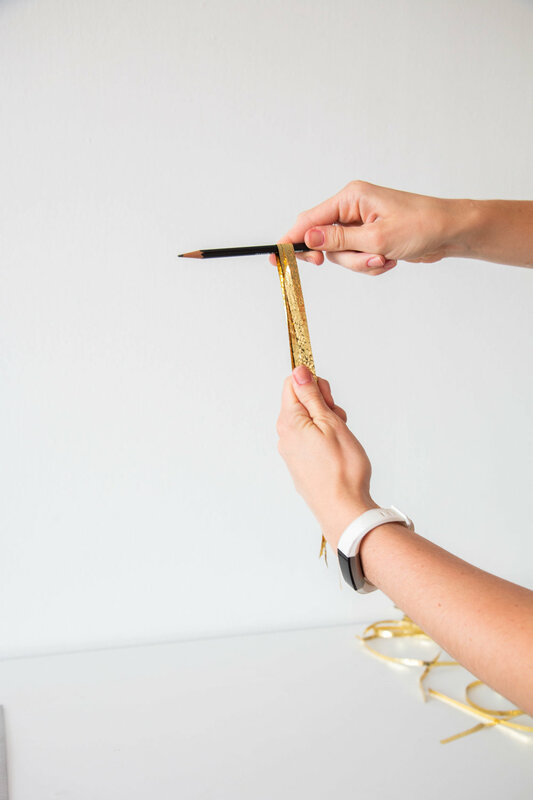 Step 5: Take a piece of washi tape about 3 inches long, wrapping it around the top of the fringe while still folded over the pencil. Once secure, pull your pencil out and add a piece of clear packing tape to reinforce the hold. And that's ALL. Now your tassels are ready to be tied onto your balloons. We prefer to tie our right up near the knot!